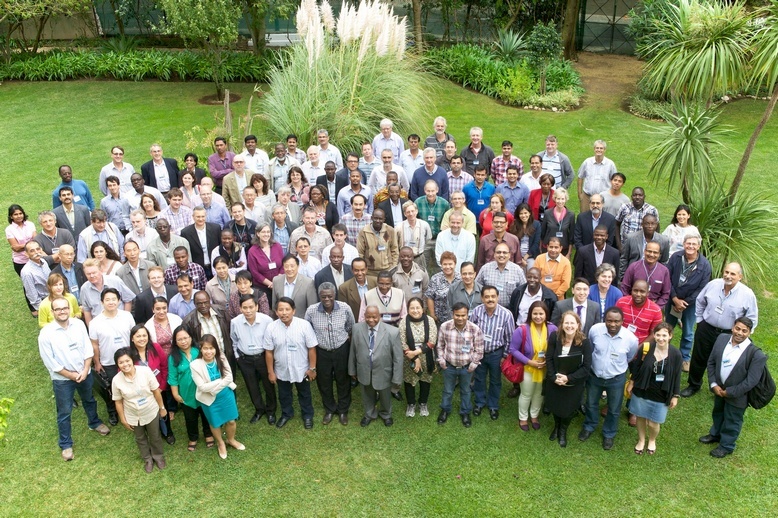 Participants at the 2013 GRM. High-resolution version on our Flickr account. The General Research Meeting (GRM) is by far the largest and most important event on our calendar. This year’s GRM was held on September 27‒30 2013, with 135 people from 35 countries attending (see list). Various presentations were made on progress and next steps on research in GCP projects, including for GCP’s Integrated Breeding Platform (IBP). Focus was on GCP’s nine focus crops in Phase II – beans, cassava, chickpeas, cowpeas, groundnuts, maize, rice, sorghum and wheat, with the poster sessions adding a couple more (see ‘sixty posters’ below). You can view the presentations made on our website (to see them in the context of the overall agenda), or on SlideShare (all gathered in one place). We have uploaded all but one presentation, where we’re still waiting for the presenter’s permission to publish. A comprehensive update on all GCP projects is here (PDF). The meeting was a blend of plenary sessions on core topics and research updates, and ‘drill-down’ breakouts on crops, data management and capacity building (the last two, in the context of IBP’s proposed Phase II, which had its own dedicated one-day stakeholder meeting after GRM, on 1st October). We didn’t just talk to ourselves: we made a bit of noise on social media to also bring in other voices into the GRM discourse and chit-chat, using the hashtag #GRM13, creating a good buzz of conversations. Also linking in to GRM were our LinkedIn followers. And neither was it all business, science and rigid structure: there was free-flow too, with an open afternoon where participants could take a relaxing break, organise their own meetings, or take a tour to Lisbon. Some of the scenes from the tour are posted on Flickr, as are other snapshots from the meeting. We’ve since gathered up some of the social media posts on Storify. GRM was far from its grim-sounding abbreviation and hashtag on social media: exemplifying the best of the ‘GCP spirit’, the sessions were engaging, relaxed, conversational and spiced with humour and a light touch, despite the ‘heavy’ topics under discussion (see agenda). But the topic at hand was grim, since the situation is dire – drought affects almost all crops and all regions worldwide. As drought tolerance is our key focus since inception, most of the discussions naturally centred on this topic. Equally important is the scourge wrought by pests and disease, which afflict some crops more than others. For example, under most circumstance, cassava is naturally very drought-tolerant, but what good will this do if cassava survives drought only to succumb to the deadly pests and diseases that stalk this drought champion? GRM was also a time for both stocktaking and mapping the future given GCP’s sunset in 2014. A central and recurring theme was GCP’s transition strategy, and how – and where – to embed GCP-initiated projects that will extend beyond the Programme’s lifetime. For this, the CGIAR Research Programs (CRPs) are a natural first choice. GRM enjoyed a very good representation of the CRPs, with all six crop CRPs represented, some at the highest level. A few members of our Executive Board also attended. Board Chair, Andrew Bennett, set the right tone for the meeting. In his remarks at the opening session, he emphasised that this was not a time for sadness, swan songs and moping as GCP approaches sunset. Rather, it was a time to appreciate the beauty of sunsets, in the sure knowledge that sunsets give rise to moon-rise! A section of Poster Session II presenters. In the foreground, Andrew Bennett, Chair, GCP Executive Board. The poster session was as lively as always, with a record of… (hold your breath!) 60 posters presented, surpassing the previous GRM in 2011 which attracted 53 posters. Sixty was a PERFECT number for the 60-second sizzle, where each poster presenter had a maximum of 60 seconds (and not a second more!) to present at plenary, devising whichever means necessary to attract the audience to their poster. It was easy to discern the brash ‘old hands’ who had perfected their art after several GRMs; the tricksters and various reincarnations of The Artful Dodger amongst them, trying to beat the clock; new and slightly jittery presenters who were more than just a little bewildered but still proved their mettle; and the new, sassy and confident. This beautiful blend apart, the poster session brought in not only new faces to add to the familiar ones, but also refreshing new tastes to diversify and sweeten our Staple of Nine crops. To our diet of cereals, legumes and tubers, poster presenters from The Philippines added eggplants, rounded off with bananas for dessert. “Definitely time for dessert, and do not disturb!” they seem to be saying. 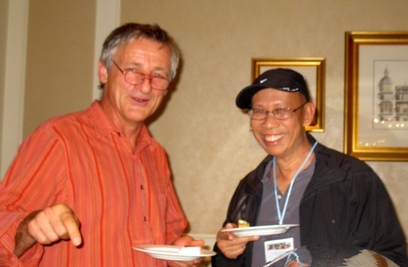 Jean-Christophe Glaszmann (left) and Hei Leung (right), who played ace roles on a multi-partner GCP project on bananas. As always, GRM was a mingling of old and new friends, a time for some paths to meet and for new forks to branch out, a season to reflectively look back and progressively face forwards. In keeping with Andrew’s continuity of sunsets giving way to moonrise, we said a group goodbye to Rajeev Varshney, former Genomics Theme Leader, who left the GCP Management Team in August. And we were happy to once again welcome, embrace and recognise two old friends – Jean Christophe Glaszmann (CIRAD) and Hei Leung (IRRI), who were, respectively ex-Subprogramme Leaders for genetic diversity and genomics in GCP Phase I, and continue to be involved with GCP as researchers, as will Rajeev. In this picture, we caught up with them at a very appropriate moment: dessert during the Gala Dinner. Take it from us, these two guys are well versed in matters dessert, with a dash of science, as this blast from the past on bananas attests, also summarised in a Facebook photo-story here. We are indeed a Hotel California of sorts – always open for check-in and checkout. As for leaving…we’re still working on the modalities of that! And despite the fond farewell, truth is Rajeev is not going anywhere either, as far as GCP is concerned. You only needed to have been at GRM or following the conversations on Facebook and Twitter, especially the photos, to witness this. He was (delightfully!) all over the place, passing on his ‘positive epidemic’ of highly infectious enthusiasm and incredible energy. 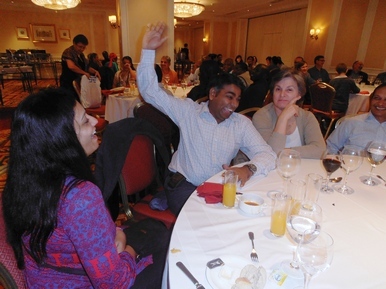 Here he is in action at the Gala Dinner in the photos below, which really need no caption. We’re sure you’ll be able to easily spot Rajeev, ‘high-fivin’ and ‘rapping’, eclipsing the GCP Director, who however appears quite pleased in his lower perch with Rajeev on the platform. But if you’re truly lost and can’t spot the super-charged high-energy guy in the photos, no worries! Here are some handy clues. Rajeev’s energy goes beyond GRM and GCP; this year as in previous ones, he received several awards, among them, the Young Crop Scientist Award by Crop Science Society of America, and the Illumina Agriculture Greater Good Initiative Award. 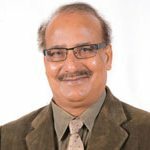 Prior to these recognitions during the Gala Dinner, Jean-Marcel formally honoured ICRISAT’s Hari Upadhyaya (pictured) during plenary for two awards Hari had received in the course of the year, also from the Crop Science Society of America. These awards were for Hari’s notable contributions – at international level – to crop science, and to plant genetic resources. Hari is a long-term GCP Principal Investigator, working primarily on sorghum. But that is not the only crop he works on. 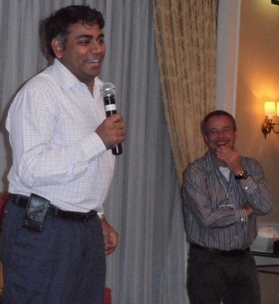 Hari was the lead author of the joint chickpea and pigeonpea chapter in our book on drought phenotyping. Unlike other GRMs where we’ve requested participants to evaluate the meeting, we did not do so this year, since this is very likely the last meeting of its kind, and the goal of the evaluation is to use participant feedback to improve future meetings. With the help of our participants, we’ve applied the lessons we’ve learnt from them through the years to arrive at what we believe to be a winning combination, balancing the diverse interests of our participants for overall improvement of their GRM experience.